Gmail has been the most popular web-based email service which provides a quick and easy account creation. Gmail may be today’s most used e-mail service but apart from several good features many folks think that it is far to be the best. There are several Gmail products such as YouTube, Google Drive, and Google Plus which are used in across the world but there are several people who considers that Gmail compose window is pretty much buggy and less user friendly. The Gmail is widest reach email service but the major problem has been faces by the people are you can view only one account at a time whether you have more than one. There are several other Internet emails service providers which are being popular across the world and can be used as an alternative of Gmail.com. If you are also looking for some best alternative of Gmail, this information is for you. If you want to import your account from other mail service to Gmail, there’s no way to do that. Although, you are free to open more than one tab with various email accounts, however this is not as much as perfect email service. Above all, Google examines every email message which are sent and received. This is done with the goal that promoters can better target clients and display advertisements which are more significant to them despite the fact that from a Gmail client’s angle, this is viewed as an attack of security. 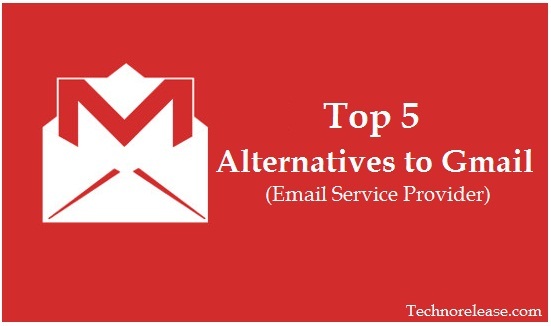 Hence for these cause or for different you are willing to try something new which may be capable to prevent these error then here are 5 alternative email service except Gmail which are being so popular across the world. Outlook has now become one of the most famous world-wide email service which is used to send and receive secure mailing service. Outlook has been launched by Microsoft replaced Hotmail messenger service. You may introduce your emails from Windows Mail, Outlook Express or Windows Live Mail. Most of the Facebook users don’t know that a Facebook account holder automatically holds a @facebook.com email account. You may not only send emails your friends at their Facebook email address but receive. Sending mails via Facebook is very similar to sending a private message on Facebook. You can enter an email address instead of your name. Apart from that you may send gourp messages, mute conversation and of course see full conversation history. Hushmail is another frequently growing web-based email service which also function on Android, Blackberry and iPhones. With this mailing service you can get no advertisements, built-in encryption, and a 25GB storage space allowance. Zoho is a protected and ad-free email service which functions with your own domain. If you are new on Zoho and want to get a free trial then with the Zoho free plan you may host only domain at a time, and get more than 5 users and up to 3 groups. It works on any mobile device which should be supported IMAP and POP. Apart from that you can fetch your inbox from other email account in Zoho mail.